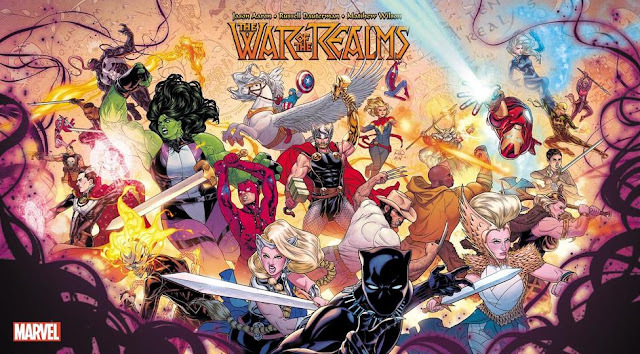 Recent Hall-of-Famer George Perez is more known, now, for Crisis on Infinite Earths and the Infinity War cycle, which will soon be a two-part Summer blockbuster for Marvel and Disney. 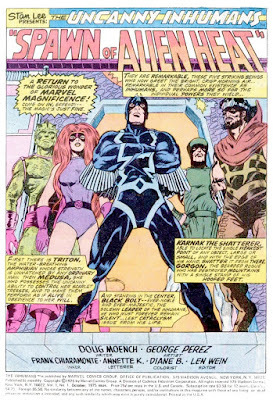 But back in 1975, when just starting as a professional penciler, Perez quietly revolutionized how the Inhumans were portrayed. Perez's elegant layouts, articulate line art, and constantly flowing visuals smoothed away the blocky, design-heavy patterns of Jack Kirby’s original portrayal. This was followed in kind by Gil Kane, and intentionally or not, ultimately has shown beautifully through in Jae Lee’s and other more recent takes. With layouts more reminiscent of European albums than many of his superhero-drawing contemporaries, each page of Perez’s fives issues (1-4, then 8, our of a 12 issue series) looked like a complete experience. 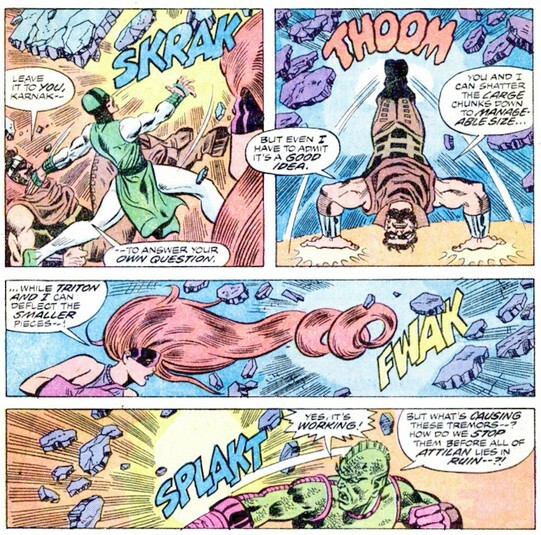 There were Steranko-esque triptychs of mobile figures walking or flying, stacks of motion that would ricochet your eyes to the right with a punch, then left as living hair flung someone away, only to settle, dead center, afterwards, with something directed straight at the reader. And, the panels would line up like glorious architecture, like fitted, purposeful mosaics. Perez was not committing to the amazing scenes where a dozen or more characters would interact in novel yet sensible ways, but his work with individual characters, already had a sheen of brilliance. His mastery of body language led even to individual characters not falling or passing out in the same ways. Conscious and mobile, figures were individual, personality and accoutrements defined posture and gesture. Even as almost every issue had a different inker, a different colorist, the underlying pencil-work gives a coherence and a sense of development to the changes wrought by other hands. 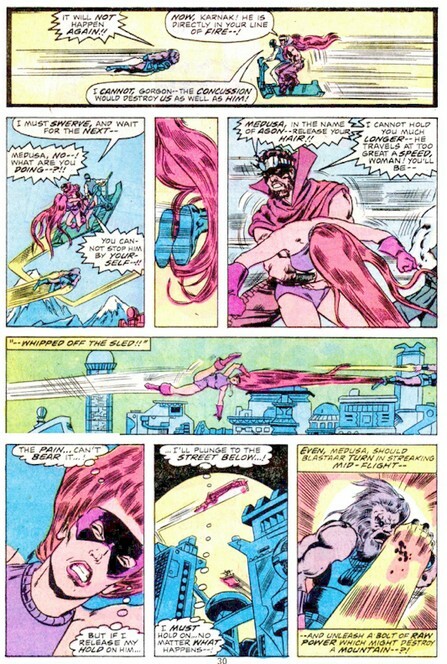 Diane Buscema and Janice Cohen’s sense of balance and flowing contrasts seems to me to compliment Perez’s elegance and orderliness more than later colorists’ sometimes garish or monochromatic execution, but these were produced fast and without any expectation of reprint or permanence. 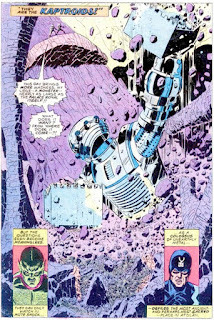 The move from subtlety to directness almost carries a narrative arc to it, anchored by the solid tone of Perez’s art, and that of his replacements, Gil Kane, and then Keith Pollard. 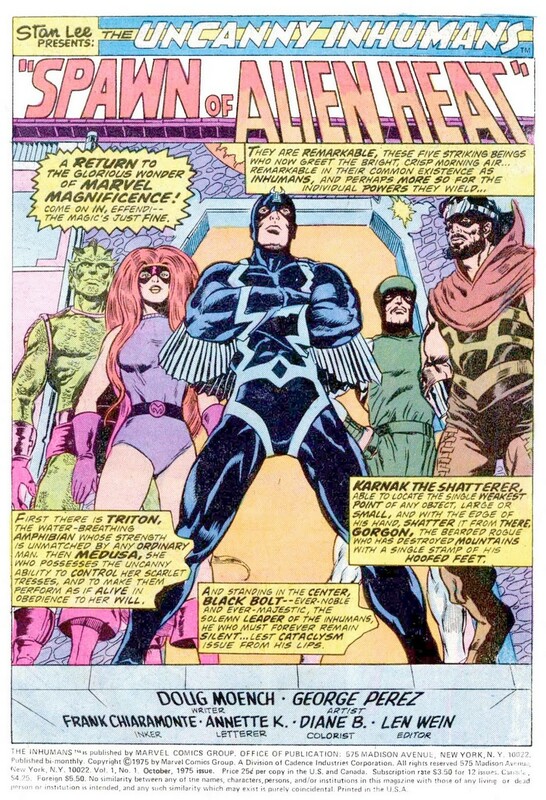 Pollard and Kane are their own artists, their own selves, but on Inhumans, they seem straight in line, not so much with the Kirby version that preceded, but very much with the Perez new view. The Inhumans, as a book but moreso as a trademark, as a grouping, had become Perezed, had become Romantic, lush and living, almost languidly actioning, and any reductions, since, to a four panel, icon-heavy puncher or to more “realist” standing in a field versions (such as the otherwise great Paul Ryan did during his tenure on Fantastic Four) leave something missing, a vital aspect stolen away. You can’t take bricks out of the base of a building and hope it to stand and represent as well as it did when whole, and that’s what Perez’s art did. George Perez made the Inhumans whole, made every brick count and every brick hold its weight. How Old Should Spider-Man Be?